Goals without action is just a dream wasted. Once you set your long term goals, create a detailed plan for the next ninety days. Break the 90 day goals into monthly, weekly and daily goals. Don’t rely on your memory to remember your entire to-do list for a day. At the end of a day, identify and prioritize the top 6 action items for the next day ahead. Rather than waiting for the right time for things to happen, when you set a dead line for a task, you will have urgency in completing the task . There is lot of power in writing the plan down and following through. 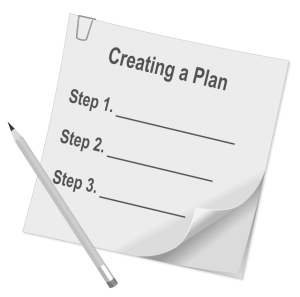 Writing out your plan forces you to be specific about it. It reminds you of its strengths, and it will expose its weaknesses. Getting things done is a habit. You can cultivate it by following systematic strategies. Just like breakfast is the most important meal of the day, the first thing you accomplish at work sets the tone for the rest of the day. So, as Brian Tracey says, “eat the frog” – do the most important thing, the one you are most likely to procrastinate on if you don’t do something about it, first and get it off your list. This will motivate you to complete the list quickly and leave you free to do the things that you enjoy doing for the rest of the day. At the end of the day, review the status of the tasks. If you fail to accomplish one of the tasks you’ve planned for the day (even if it’s partially or mostly finished), add it to the next day pool. Don’t cross it off and assume you’ll take care of it tomorrow. Make course corrections to the plan as needed. When you take 6 chops at a tree with a sharp axe every day, eventually you will cut the tree no matter how big and strong it is. Go ahead, and get your axe ready. This entry was posted in Discipline, Habits on April 1, 2015 by admin.